I will be participating in several reading events during the upcoming month: The Broken Kingdoms Readalong, which I’m helping to host, Vintage Sci-fi Month, and the Bout of Books 9.0 Readathon. My goals are a bit ambitious, but I’m trying to keep them realistic. Every January, Andrea at The Little Red Reviewer hosts the Vintage Science Fiction Month Not-A-Challenge. The idea is to read and enjoy sci-fi from before 1979. This event pairs well with the 2014 Science Fiction Experience hosted by Carl at Stainless Steel Droppings. As January is looking like a busy month, I’d like to make sure to read at least two books for the event. One will be a part of John Norman’s Gor series, which is one of my guilty pleasures. The other will be the next book in Edgar Rice Burroughs’ Barsoom series, which began with A Princess of Mars. Both books are sure to be over-the-top in a fun but not quite serious kind of way. After participating in a readalong of N.K. Jemisin’s The Hundred Thousand Kingdoms, several of us decided that we’d like to continue reading the Inheritance trilogy. I am helping to co-host the readalongs of The Broken Kingdoms and The Kingdom of the Gods, along with Lauren from Violin in a Void and Susan from Dab of Darkness. 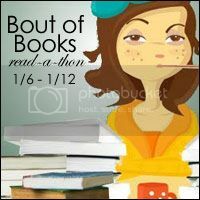 Bout of Books 9.0 is a week-long readathon which challenges participants to read more than they usually would in a week. It lasts from January 6-January 12, and includes fun mini-challenges and Twitter events. Since Bout of Books coincides with my first week at a new job, my goals are relatively modest. I will focus on shorter fiction and novellas rather than chunksters so that I’m not tempted to stay up late reading. I have a few of these on my Kindle that I’ve been saving, including J. M. Guillen’s The Herald of Autumn, Laini Taylor’s Night of Cake and Puppets, and The Snow Queen by Alana Albertson. I’d also like to finish Edgar Rice Burroughs’ The Gods of Mars in an overlap with Vintage Sci-fi Month. Are you participating in any January reading events? Any exciting plans for 2014? I love the cover for The Broken Kingdoms! Bout of Books will be my first read-a-thon EVER next week – so I’m quite looking forward to it! I haven’t narrowed down my book choices just yet though… Not quite that organised! Lol. Good luck next week.